Sporotrichosis is caused by the acquisition of Sporothrix schenckii, a dimorphic, saprophytic, and geophilic fungus. Although this fungal infection has been reported in semiarid environments, it is most typically found in warmer temperatures and tropical climates around the world. S schenckii usually grows amidst decaying vegetable matter and in the soil as a saprophyte. Saprophyte can also be commonly found in soil, straw, wheat grain, fruits, tree bark, wood, shrubs, thorns, rose shrubs, decaying vegetation and timber. However, it is most acquired by humans when a form of traumatic inoculation occurs after in contact with animals. The most common animals known to have spread Sporotrichosis are cats, dogs and horses. Sporotrichosis spreading from human to human is quite rare (international Journal of Dermatology). Because sporotrichosis may be difficult to initially diagnose, a differential diagnosis should always be generated during the clinical evaluation (see Differentials). Benjamin Schenck first noted Sporotrichosis in 1896. In the year 1900, Hekton and Perkins officially named the pathogenic fungus Sporothrix Schenkii after its original founder (international journal of dermatology). The association between sporotrichosis and acquired immunodeficiency syndrome (AIDS) was first reported in 1985. Although it is not considered an AIDS marker, it is included in a list of AIDS-related conditions. In immunocompromised patients, especially those with an impaired cell-mediated immunity, it can become an opportunistic infection with a possible life-threatening course. Sporotrichosis with cutaneous necrosis and lymphangitic (sporotrichoid) spread. 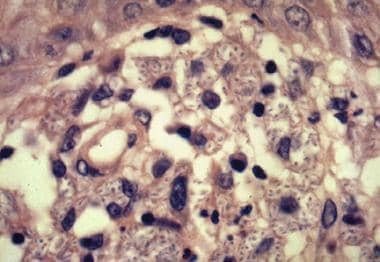 A 28-year-old white man presented for evaluation of a poorly healing, asymptomatic, round plaque acquired on the dorsum of his left hand. The lesion had been present for approximately 3 weeks. Glucose-peptone agar culture plates revealing colony growth of Sporothrix schenckii. 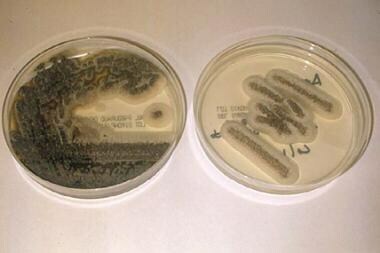 The left plate reveals older colonies as dark brown or black, and the right plate reveals younger white colonies with a brown center, characteristic of this fungus. 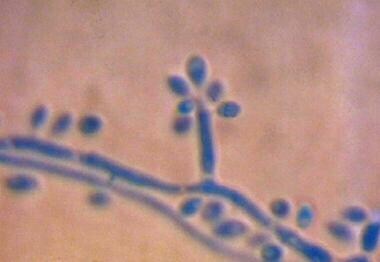 Microscopic examination of a blue dye preparation from the colony surface reveals elongated septate hyphae with groups of microconidia in a flowerlike arrangement. 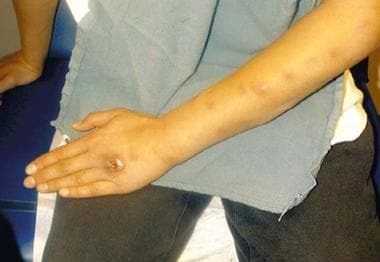 A well-circumscribed, moderately elevated, erythematous plaque with central ulceration is found on the dorsum of this patient's left hand. Potassium chloride (KOH) stain was negative for fungal elements. A 2 X 2 cm, dome-shaped, well-circumscribed, erythematous plaque is shown proximal to the left ring finger. The lesion was draining a serosanguineous fluid. No purulence was noted. Biopsy rarely reveals the 6-mcg cigar-shaped yeast within tissue macrophages as shown in this histologic section. This is the morphology that Sporothrix schenckii assumes at 37°C. 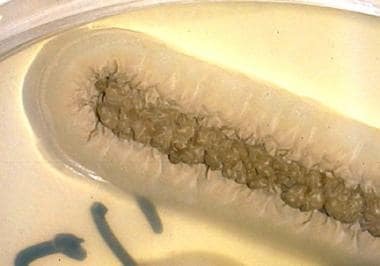 Moist cream-colored colonies with a central, dark, leathery, and wrinkled surface growing at 25°C is highly suggestive of Sporothrix schenckii. 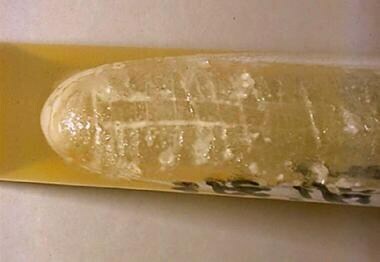 A fresh agar slant of Sporothrix schenckii reveals moist, white-to-cream–colored, yeastlike colonies. Cutaneous, ulcerating, painless nodule on the hand and a classic sporotrichoid lymphangitic pattern spreading proximally up the arm. The fungus is most commonly acquired by traumatic implantation into the skin, causing a local pustule or ulcer with nodules developing proximally along the draining lymphatics. Once implanted, this saprophytic fungus can grow in human tissues. Clinically, sporotrichosis may manifest as either an acute or a chronic subcutaneous mycotic infection. Although the acute phase is most common, chronic nodular lymphangitis also reportedly develops in some cases. A minor puncture wound or splinter is sufficient to inoculate the fungus into the tissue. Infection can also be related to zoonotic spread from infected cats or scratches from digging animals, such as armadillos. Among animals that can spread sporotrichosis, cats have been found to be the most common. Cats most often transfer sporotrichosis through bites and scratches (Molecular Epidemiology of Feline Sporotrichosis). Sporotrichosis is an uncommon fungal infection of unknown frequency. Sporotrichosis is usually associated with minimal morbidity. Increased morbidity and, rarely, mortality may occur if the diagnosis is delayed, if the fungus infects patients who are immunologically compromised, or if inadequate or inappropriate therapy is rendered. Sporotrichosis has no racial predilection. Sporotrichosis occurs in men, women, and children. Men have a higher risk of acquiring this fungus because they have greater environmental exposure from outdoor occupations. Sporotrichosis may occur in people of any age. Yet, in children, sporotrichosis tends to present more frequently with a solitary ulcerative nodule. This is in contrast to adults in which a classic lymphocutaneous form is more common. Orofino-Costa R, Macedo PM, Rodrigues AM, Bernardes-Engemann AR. Sporotrichosis: an update on epidemiology, etiopathogenesis, laboratory and clinical therapeutics. An Bras Dermatol. 2017 Sep-Oct. 92 (5):606-620. [Medline]. [Full Text]. [Guideline] Kauffman CA, Bustamante B, Chapman SW, Pappas PG. Clinical practice guidelines for the management of sporotrichosis: 2007 update by the Infectious Diseases Society of America. Clin Infect Dis. 2007 Nov 15. 45(10):1255-65. [Medline]. Vilela R, Souza GF, Fernandes Cota G, Mendoza L. Cutaneous and meningeal sporotrichosis in a HIV patient. Rev Iberoam Micol. 2007 Jun. 24(2):161-3. [Medline]. Zhou CH, Asuncion A, Love GL. Laryngeal and respiratory tract sporotrichosis and steroid inhaler use. Arch Pathol Lab Med. 2003 Jul. 127(7):893-4. [Medline]. Lyon GM, Zurita S, Casquero J, et al. Population-based surveillance and a case-control study of risk factors for endemic lymphocutaneous sporotrichosis in Peru. Clin Infect Dis. 2003 Jan 1. 36(1):34-9. [Medline]. Ramírez Soto MC. Sporotrichosis: The Story of an Endemic Region in Peru over 28 Years (1985 to 2012). PLoS One. 2015. 10 (6):e0127924. [Medline]. Leme LR, Schubach TM, Santos IB, et al. Mycological evaluation of bronchoalveolar lavage in cats with respiratory signs from Rio de Janeiro, Brazil. Mycoses. 2007 May. 50(3):210-4. [Medline]. Feeney KT, Arthur IH, Whittle AJ, Altman SA, Speers DJ. Outbreak of sporotrichosis, Western Australia. Emerg Infect Dis. 2007 Aug. 13(8):1228-31. [Medline]. Song Y, Li SS, Zhong SX, Liu YY, Yao L, Huo SS. Report of 457 sporotrichosis cases from Jilin province, northeast China, a serious endemic region. J Eur Acad Dermatol Venereol. 2011 Dec 17. [Medline]. Almeida-Paes R, Pimenta MA, Pizzini CV, Monteiro PC, Peralta JM, Nosanchuk JD. Use of mycelial-phase Sporothrix schenckii exoantigens in an enzyme-linked immunosorbent assay for diagnosis of sporotrichosis by antibody detection. Clin Vaccine Immunol. 2007 Mar. 14(3):244-9. [Medline]. Bonifaz A, Tirado-Sánchez A. Cutaneous Disseminated and Extracutaneous Sporotrichosis: Current Status of a Complex Disease. J Fungi (Basel). 2017 Feb 10. 3 (1):[Medline]. [Full Text]. Benvegnú AM, Stramari J, Dallazem LND, Chemello RML, Beber AAC. Disseminated cutaneous sporotrichosis in patient with alcoholism. Rev Soc Bras Med Trop. 2017 Nov-Dec. 50 (6):871-873. [Medline]. Sharma NL, Mahajan VK, Verma N, Thakur S. Cutaneous sporotrichosis: an unusual clinico-pathologic and therapeutic presentation. Mycoses. 2003 Dec. 46(11-12):515-8. [Medline]. Bonifaz A, Fierro L, Saul A, Ponce RM. Cutaneous sporotrichosis. Intermittent treatment (pulses) with itraconazole. Eur J Dermatol. 2008 Jan-Feb. 18(1):61-4. [Medline]. Chen S, Sun KY, Feng XW, Ran X, Lama J, Ran YP. Efficacy and safety of itraconazole use in infants. World J Pediatr. 2016 Jun 10. [Medline]. Almeida-Paes R, Pimenta MA, Monteiro PC, Nosanchuk JD, Zancope-Oliveira RM. Immunoglobulins G, M, and A against Sporothrix schenckii exoantigens in patients with sporotrichosis before and during treatment with itraconazole. Clin Vaccine Immunol. 2007 Sep. 14(9):1149-57. [Medline]. Baroni A, Palla M, Iovene MR, et al. Sporotrichosis: success of itraconazole treatment. Skinmed. 2007 Jan-Feb. 6(1):41-4. [Medline]. Baum GL, Donnerberg RL, Stewart D. Pulmonary sporotrichosis. N Engl J Med. 1969 Feb 20. 280(8):410-3. [Medline]. Bonifaz A, Peniche A, Mercadillo P. Successful treatment of AIDS-related disseminated cutaneous sporotrichosis with itraconazole. AIDS Patient Care STDS. 2001 Dec. 15(12):603-6. [Medline]. Davis BA. Sporotrichosis. Dermatol Clin. 1996 Jan. 14(1):69-76. [Medline]. De Araujo T, Marques AC, Kerdel F. Sporotrichosis. Int J Dermatol. 2001 Dec. 40(12):737-42. [Medline]. Dolezal JF. Blastomycoid sporotrichosis. Response to low-dose amphotericin B. J Am Acad Dermatol. 1981 May. 4(5):523-7. [Medline]. Dunstan RW, Langham RF, Reimann KA. Feline sporotrichosis: a report of five cases with transmission to humans. J Am Acad Dermatol. 1986 Jul. 15(1):37-45. [Medline]. Gordhan A, Ramdial PK, Morar N. Disseminated cutaneous sporotrichosis: a marker of osteoarticular sporotrichosis masquerading as gout. Int J Dermatol. 2001 Nov. 40(11):717-9. [Medline]. Hajjeh R, McDonnell S, Reef S. Outbreak of sporotrichosis among tree nursery workers. J Infect Dis. 1997 Aug. 176(2):499-504. [Medline]. Horii KA, Jackson MA, Sharma V. Localized cutaneous sporotrichosis in a child. Arch Dermatol. 2006 Oct. 142(10):1369-70. [Medline]. Karakayali G, Lenk N, Alli N. Itraconazole therapy in lymphocutaneous sporotrichosis: a case report and review of the literature. Cutis. 1998 Feb. 61(2):106-7. [Medline]. Kauffman CA, Pappas PG, McKinsey DS. Treatment of lymphocutaneous and visceral sporotrichosis with fluconazole. Clin Infect Dis. 1996 Jan. 22(1):46-50. [Medline]. Lynch PJ, Voorhees JJ, Harrell ER. Systemic sporotrichosis. Ann Intern Med. 1970 Jul. 73(1):23-30. [Medline]. Meffert JJ. Cutaneous sporotrichosis presenting as a keratoacanthoma. Cutis. 1998 Jul. 62(1):37-9. [Medline]. Mohan N, Jayaseelan E, Abraham A. Cutaneous sporotrichosis in Bangalore, southern India. Int J Dermatol. 43(4):269-72. [Medline]. O'Reilly LC, Altman SA. Macrorestriction analysis of clinical and environmental isolates of Sporothrix schenckii. J Clin Microbiol. 2006 Jul. 44(7):2547-52. [Medline]. Rodriguez G, Sarmiento L. The asteroid bodies of sporotrichosis. Am J Dermatopathol. 1998 Jun. 20(3):246-9. [Medline]. Sandhu K, Gupta S. Potassium iodide remains the most effective therapy for cutaneous sporotrichosis. J Dermatolog Treat. 2003 Dec. 14(4):200-2. [Medline]. Sanz J, Andreu JL, Martinez-Garcia G. Sporotrichial bursitis. Br J Rheumatol. 1998 Apr. 37(4):461-2. [Medline]. Ticoras CJ, Schroeter AL, Hornbeck KL. Disseminated ulcerated papules and nodules. Cutaneous disseminated sporotrichosis. Arch Dermatol. 1996 Aug. 132(8):963-4, 966-7. [Medline]. Ware AJ, Cockerell CJ, Skiest DJ. Disseminated sporotrichosis with extensive cutaneous involvement in a patient with AIDS. J Am Acad Dermatol. 1999 Feb. 40(2 Pt 2):350-5. [Medline]. Werner AH, Werner BE. Sporotrichosis in man and animal. Int J Dermatol. 1994 Oct. 33(10):692-700. [Medline]. Whitfeld MJ, Faust HB. Lymphocutaneous sporotrichosis. Australas J Dermatol. 1995 Aug. 36(3):161-3. [Medline]. Zaharopoulos P. Fine-needle aspiration cytologic diagnosis of lymphocutaneous sporotrichosis: a case report. Diagn Cytopathol. 1999 Feb. 20(2):74-7. [Medline].